Sorry if this is addressed somewhere else. I had a shop install feal 441's on my 2002 IS about a year ago. I've had a soft clunk from the passenger side rear since day 1. It's louder at slower speeds. At first I chalked it up to "normal" coilover sounds, but more and more it's really bugging me. I had a different shop look into it, but they said they couldn't find anything wrong. I checked it out myself and I found that it's coming from play where the coilover connects to the rear suspension arm. It looks like the mounting hole in the bottom of the coilover is too large for the bolt size. It allows a few millimeter of play. Enough to make a clunk over bumps. I tried torqueing the bolt tighter, but it doesn't make any difference. The other side doesn't have this issue. Is there supposed to be some sort of adaptor or rubber sleeve that was supposed to go over the bolt? Anyone have a fix for this? I know I should take it back to the shop that originally installed it, but I wasn't very happy with the installation. I had to take it back twice already because they mounted the head light sensor wrong. I had to figure out the issue myself and explain it to them to fix it. I also got my car back covered with some kind of metal fallout that I had to scrub off of my paint. Needless to say, I don't want to go back there again. How much difference? If it is a micron or something. Just wrap the bolt with some brass sheet shimming material. Or as a temporary try. You could wrap it with electrical tape to close the gap. Just to see if it changes.A clunk sound sounds more like preload on the coil over. Thanks 01 Solar Yellow. I'll experiment with it and see. The difference is like a millimeter space around the bolt. While troubleshooting, I did tighten the top mounting bolts, the top bolt on the coilovers and I also tightened the preload. None of these things helped. The bottom of the coilover has a bushing in it. In the center of the bushing is a steel sleeve which the mount bolt bolts through. The steel sleeve should be held captive between the two sides of the arm when it's torqued down. So the question is where is the movement coming from? Is the bushing flopping around inside the metal ring, is the bolt that goes through the sleeve moving around relative to the sleeve? I'd expect the sleeve to be held in place by the arm and the bolt. If it is fixed in place like that, this suggests the bushing has failed or that the ring that holds the bushing has opened up. Someone with a flashlight ought to be able to figure out what parts are moving around. Thanks Ek9B18. I took another look at it today. The bushing and the holes on the rear suspension arm look to be at least a few millimeters larger than the bolt. With the bolt in and not torqued down you can see it has quite a bit of play. I'm wondering if the bolt is not the original size. That suspension arm was replaced in an accident 15 years ago. I wonder if the repair shop used a bolt that wasn't stock specs. Then again the problem only showed up after I had the coilovers installed. Maybe the shop that installed them swapped out the bolt. I'll order a new bolt from the local dealer and see. I guess worse come to worse, I could check the drivers side. There's no issues with that side. BTW. While I was at it, I tried a few things. I tried to shim it with a bicycle tube first. I couldn't get the rubber in there without it being torn up. Then I tried a thin piece sheet metal, but I barely got it fit in and then it didn't make much difference. I also tried duct tape and as a last resort, I stuffed it with lithium grease. Nothing worked. Then again the problem only showed up after I had the coilovers installed. Maybe the shop that installed them swapped out the bolt. I'll order a new bolt from the local dealer and see. I guess worse come to worse, I could check the drivers side. There's no issues with that side. There's going to be some slop when it's not tight. That's why I mentioned how the sides of the arm should be locking the sleeve in place when properly torqued no matter what the diameter of the bolt is. You ought to be able to look at the end of both bolts, maybe even remove the nut first, and be able to compare the diameter on both sides. I have a feeling the sloppy side might simply not be tight enough. It's supposed to be 81 ft/lbs which is a decent amount. Thanks Ek9B18. Maybe I won't try the bolt. When I torque it down, I can see the sides of the control arm squeezing the bottom of the coilover. I set my torque wrench to 80 ft/lbs and even over torqued it for good measure. I posted a video on youtube to show what I'm talking about. I hope it helps. I'll try sending it to Feal and seeing if they have any suggestion. It sounds like it's from up top. Do you see movement? 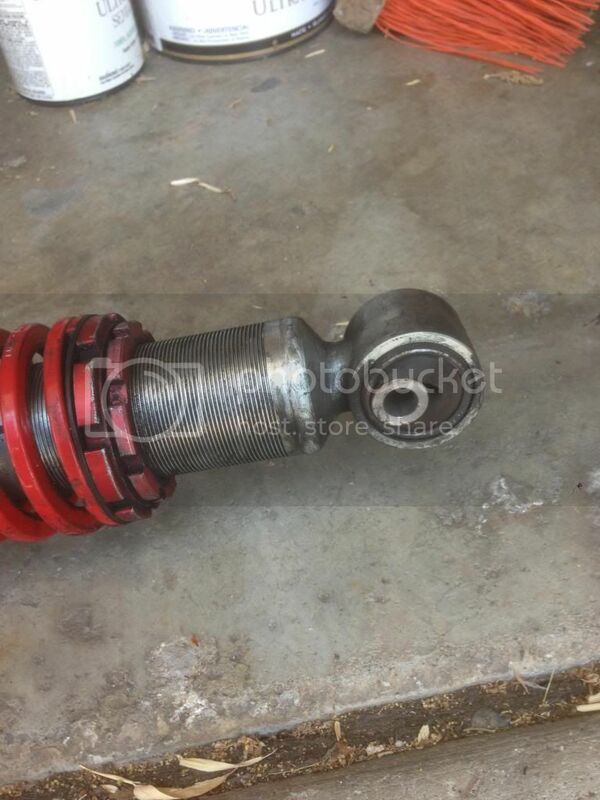 If you disconnect the sway bar by pulling that 12 mm bolt. Then remove the control arm bolt at the body end, you can swing the whole control arm down without touching the alignment stuff at the wheel end. So, body side bolt, 12 mm sway bolt (through the arm) and then the strut lower bolt. If the bushing isn't bad, the lower bolt is tightened up, there not much at the bottom there that can clunk like that. If you re-do the test with the lower bolt installed and tight, can you feel the lower part of the coilover slopping up and down and clunking when you re-do this? Is the spring completely unloaded so there's no spring pressure on the shock? You could be right. I'm not sure if I see movement. I couldn't tell by pushing up on the hub. The sound definitely resonates up top. I'm just not sure where it's coming from. The first steps I did was to tighten the top nut and also tightened the three mounting bolts on the top. The spring is not unloaded. Should it be? In fact, I tightened the preload about 5 cm to make sure the spring wasn't the cause by being loose. Is there anything else up top that could cause the knock? I probably won't be able to try troubleshooting again until Saturday. I did contact Feal suspension via facebook. They asked me to measure the sleeve. I think the I.D. was 14mm. At this point, I think I need to consider I'm looking in the wrong place. The spring is not unloaded. Should it be? In fact, I tightened the preload about 5 cm to make sure the spring wasn't the cause by being loose. I was just wondering if you could be hearing the loose spring banging on something. If it's still under compression, that's probably no possible. I'd think you'd be able grab the bottom of the coilover so the bottom of your hand touches the control arm as you grab the coilover, then have someone push up and down on the hub. You ought to be able to feel the clunk in your hand if the looseness is at the bottom. I might have someone touch the upper bolt while you move the hub up and down and feel if the upper bolt us moving up and down with the clunk. Maybe the top wasn't assembled correctly? The bolt could be tight but if say, one of the rubber bushings is crushed or missing on top, there might still be movement. So I took a few hours today and did more troubleshooting. I jacked up the rear passenger corner, removed the wheel. I grabbed the hub and jiggled it up and down. Funny thing is that this time the sound was a lot more faint. Not sure why this is the case. The only difference is that I did it in a different garage. For kicks, I disconnected the swaybar endlink. It didn't make any difference with it connected or not. I was able to get my cousin to feel the top bolt. He said it's not moving at all. I forgot to have him try grabbing the coilover, but I did try letting the control arm hit and push on the bottom of the coilover (without the bolt in). It did not make the clunking noise so I'm guessing the problem might be localized at the bolt and the sleeve. I'm stumped. I may try again this weekend, but at this point, I may just give up. I took another stab at troubleshooting. I'm leaning toward a bad bushing now. Is there supposed to be that much play in the rear LCA (????) bushing? This might be another clue. Here's a pic of the bushing. You can see a tear in it. I don't have the tools to remove it so I'll have to take it to the shop. Could this be the source of my knocking? Not sure why the video isn't playing on the forum. Here's the link again. From the Figs blog, it sounds like this is a common problem. Looks like you found the problem. The OEM bushings are a steel pin and a plastic ball. They do seem to commonly wear like the front #2 bushings.